Use up leftover bread, odds and ends in the fridge and store cupboard staples to make this spicy Mexican-inspired savoury bread bake, or ‘strata’. What’s more, the dish can be made ahead, so is ready to bake the minute you get home. Heat the oil in a frying pan over a medium heat. Add the chorizo and pepper and cook for 4-5 mins until softened and lightly browned. Transfer to a plate lined with kitchen paper to absorb any excess oil and leave to cool. Lightly grease a large baking dish (about 20 x 30cm). 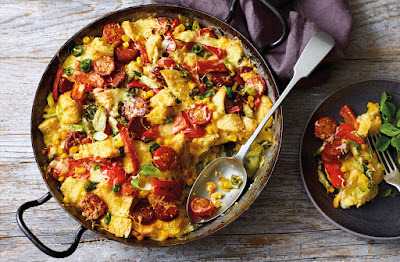 Scatter half of the bread cubes over the base of the dish, then half the chorizo and peppers, sweetcorn, tomatoes and spring onions. Cover with half the grated cheese, then the remaining bread cubes, chorizo and veg. Whisk together the milk and eggs and season to taste. Pour over everything, then sprinkle over the remaining grated cheese. Scatter over the sliced chilli, if using. Cover the dish with clingfilm and rest in the fridge for at least 30 mins or overnight. When ready to cook, preheat the oven to gas 4, 180°C, fan 160°C. Remove the clingfilm and bake for 40 mins or until the filling has puffed up and the top is crisp and golden. Allow to rest for 5 mins before serving with a simple salad, if liked. Tip: You can easily adapt this recipe to suit whatever leftovers you have at home. Use up leftover baguettes, crusty loaves, ciabatta or sourdough in this recipe – just slice thickly and chop into even-sized pieces. Thin-sliced white bread may cook slightly quicker, so check the bake after 30-35 mins.